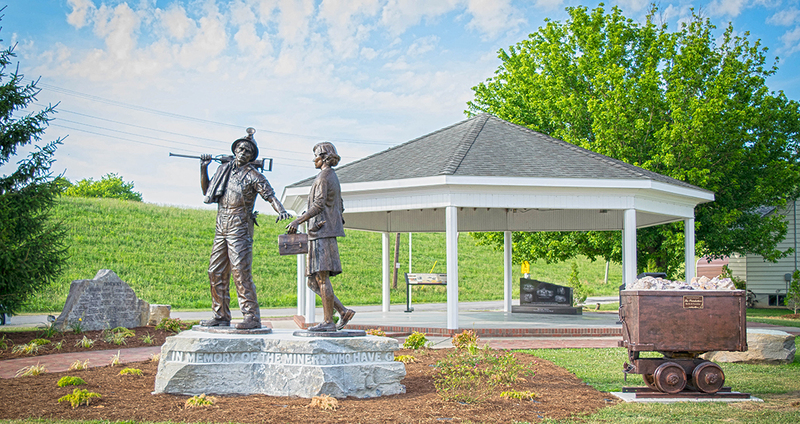 The bronze miner and his wife are designed and fabricated by well-known sculptor, David Seagraves of Elizabeth, Illinois. Every small detail down to the lunch bucket has their story. The 3 interpretive panels inside the pavilion, designed by Rich Smith of ARM, tell of local Fluorspar history, along with the story of Rosiclare. The third depicts the entire Ohio River Scenic Byway region. The granite memorial, created by Brian Bailey and his team of Bailey Monument Company, Vienna, Illinois, honor not only the seven miners who lost their lives at the Barnett mine in 1971, but all Fluorspar miners and their families. The Memorial Wall gives added inspiration for all to inscribe their own tribute. Landscaping provides for additional beautification of the site by George Partridge, Partridge Landscape, Grand Chain, Illinois. Special Thanks to the following for making the Fluorspar Miners’ Memorial Project in Rosiclare a reality: City of Rosiclare; Ohio River Scenic Byway, Inc., NFP; Brown & Roberts; Inc., Hastie Mining; Shawnee Communications; Downen Enterprises- Robert Downen; Banterra Bank; Pope County Commissioners; Hardin County Commissioners; Mike and Rhonda Belford; David and Joyce Robinson; Robert C. Winchester; Barnett Redi-Mix; Senator and Mrs. Dale Fowler; Woodmen Life; V-Cut, LLC., as well as all memorial brick and wall recipients. All involved planned this project to be a unique and educational experience about fluorite, the Illinois State Mineral, its significance, and how the 1971 mining accident in the region influenced the passage of the 1977 Federal Mine Safety and Health Act. This project will provide both Ohio River Scenic Byway travelers and our younger generation with information on how important the fluorspar industry has been to Southern Illinois and to the nation. 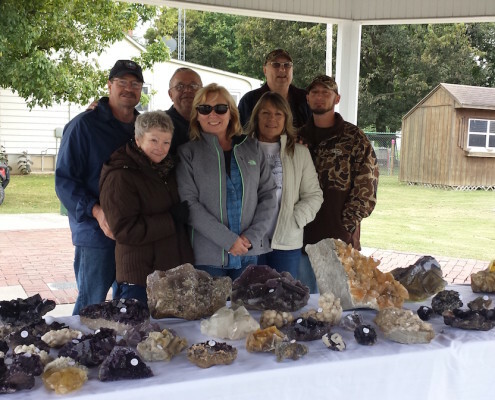 Sandy Potts; Danny Vaughn; Harold Miller; Cullum Mines; Wesley Atkinson; Roy Tolbert; Roger Brazell; Margo Stoker; Gwynn Johnson; Bill Jenkins Family.